Will the Mallory distributor/oil pump drive be correct for my engine? The Mallory distributors come with the male oil pump drive suitable for pre 1976 engines and (approx. post 1993) serpentine engines. If your oil pump requires the female drive on the bottom of the distributor shaft (for post 1976 and pre serpentine engines) we have placed some very simple instructions below on how to fit your existing gear. If you are unsure about doing this or would rather have a new drive gear (often the case on engine rebuilds) then we can supply the Mallory fitted with this post 1976 style oil pump drive for a small additional charge, please enquire. Instructions for changing to the post 1976/pre serpentine type oil pump drive gear. 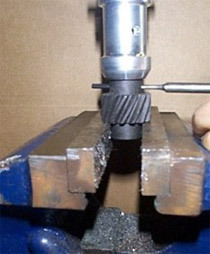 Remove the incorrect drive gear simply by punching out the Roll Pin (punch size approx. 3mm). We made ours from an old push rod as you can see. After which you can remove the male drive gear dog (cut approx. 2-5mm above) as shown. Don't worry, this won't invalidate your warranty. If using your existing drive gear, the hole will already be available. 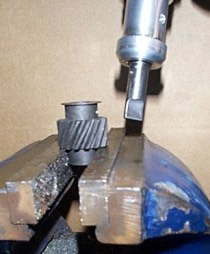 If using a new drive gear (as shown), then drill centrally through the first side. Important, do not yet drill through the opposite side. With the drive gear removed, you can now fit the new drive. 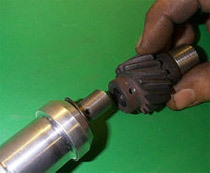 When fitting the new or existing drive gear, insert a feeler gauge as shown (right) and allow a clearance of 5-8 thou. Max. 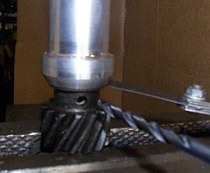 You can now drill completely through, using 4.6mm drill (approximate is OK), reinsert original drive pin and all is done.